Anise Hyssop (agastache foeniculum) Leaves have a sweet anise scent and can be used for tea or culinary purposes. Important bee plant. Fuzzy pale blue flower spikes attract bees, butterflies and beneficial insects to the garden. Easy to grow perennial in zones 3-9. Lovely as a cut flower in bouquets, sweet smelling leaves can be used in potpourri and dried floral arrangements as well. Live starter plant in 3 inch container. Hello! 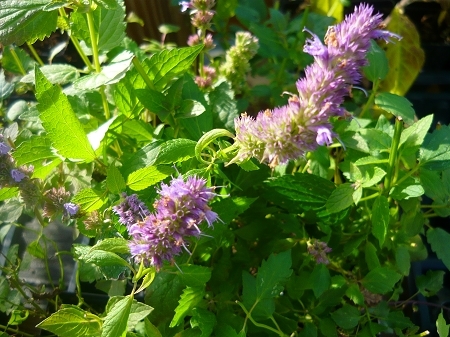 I got an Anise Hyssop this year, now it is huge and bushy, with purple spikes of flowers. The bees LOVE it!!! It smells great. I can't believe I missed this for so long. Lovely and super tolerant.